Craig Thompson's second graphic novel, the 582-page mammoth Blankets, swept the field's awards, taking three Harveys, two Eisners, and two Ignatzes. More than a decade later, and buoyed by his later successes (such as 2011's seminal Habibi), Drawn and Quarterly has produced a beautiful new edition. Blankets is Thompson's memoir of his life growing up in a poor, deeply Christian, dysfunctional family in rural Wisconsin. It tells the story of the bullying Thompson endured at school and at home; of his sweet, fraught relationship with his younger brother; of his faith and his art; of babysitter who raped him and his brother; and of the first real love he ever felt. The story is shocking and vivid, a tale as gripping as any you'll read. Thompson's spiritual journey and difficult relationship with his family is matched only by his depiction of his teenaged love and heartbreak with Raina, a girl he meets at Winter Bible Camp. It's the truest and most heartfelt description of pure youthful love as I've found. Joss Whedon calls it "one of the greatest love stories ever written, and surely the best one ever drawn." Which brings me to the art. If you, like me, discovered Thompson through Habibi, then you know just how versatile an artist he is. While Habibi brings a lot of polish to Thompson's work, Blankets has a raw, brute power that can't be overstated. I finished the book over this past weekend, on a flight to the Miami Book Fair, where I was on a panel with Scott "Understanding Comics" McCloud and when we discussed the book over a drink, he lit up, describing all the ways in which Blankets presented comics creators with a "toolkit" of graphic techniques for storytelling that, according to McCloud, creators are still only getting to grips with a decade later. 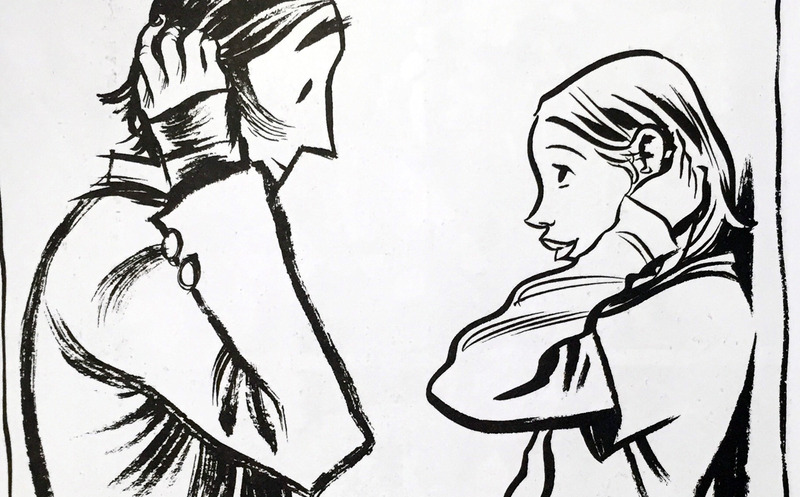 McCloud was able to effortlessly recall specific panels from the book that made his point, wordless illustrations like this one, where the negative space does so much to inform the story and the relationships between two sets of parents and their love-struck teens. I'm not a particularly visual person, but McCloud's words sent me back to the book over the weekend for a second read, this one attuned to the visual techniques more than the story itself, and that second reading was, if anything, more moving than my first pass. Thompson has a new title for kids out, Space Dumplins, which I haven't read yet, but the experience of reading Blankets has shot this to the top of my pile. Blankets is one of those graphic novel memoirs, like Alison Bechdel's Fun Home, shows off the medium's capacity to be dark and light, sweet and bitter, at the same time. No wonder that Neil Gaiman called it "the most important graphic novel since Jimmy Corrigan" and Jules Feiffer called it "a transcendent kind of storytelling that grabs you as you read it and stays with you after you put it down," adding, "I'd call that literature."